Leading the way is Manhattan High School's (KS) Sam Hankins. Hankins threw the javelin over 200 feet for a US No. 1 mark of 210 feet even. In fact, every performance so far this year from the junior have been over 200 to claim the win. Hankins has won four meets this year with throws over 200 feet including the Mid-Winter Relays (206-4), the Texas Relays (207-7), the Lansing Invitational (210), and the Pre-State Challenge (201-6). All but one of Hankins throws would be second best in the nation behind his best mark of 210. His consistency is unmatched. The only other male javelin thrower in the nation to throw farther than 200 feet is Central Catholic's (OR) Joseph Nizich. Nizich has a throw of 202-3 from the Chehalem Field and Track Classic. He has also gone undefeated so far in the 2019 outdoor season. The best female thrower in the nation right now is Mifflin County (PA) High School's Skylar Ciccolini. The senior has thrown three marks over 150eet this year and has won the Mifflin County @ State College meet, the Tim Cook Memorial Invitational, and the Mifflin County vs. Cumberland Valley meet. Her best performance came from the Tim Cook Memorial Invitational when she threw a season-best mark of 158-4. Watch out for Ciccolini this year as her best mark from 2018 was 177-0.5 showing she still has room to improve on her current US No. 1 mark. 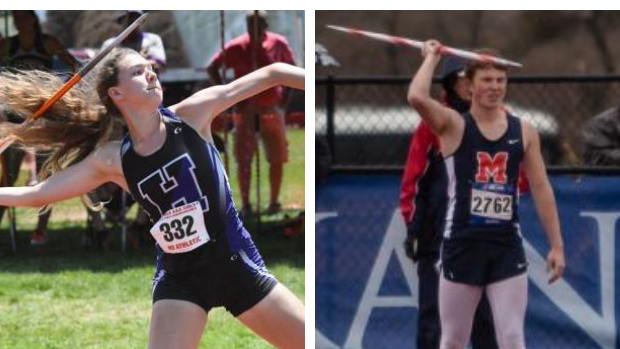 Check out all the top 5,000 boys and girls javelin performances below.